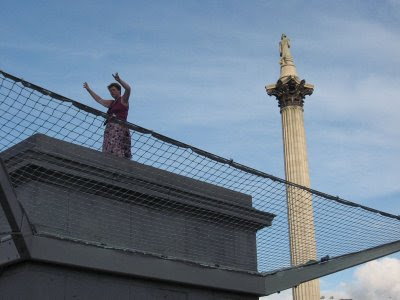 Distracted by a combination of a Boots hoisin duck wrap and the lady in the above photo dancing to a Latino jazz band on the fourth Plinth in Trafalgar Square (Nelson was looking the other way the whole time) I managed to miss the start of the Chimes and Bells set. Not to worry, although there was a very decent turn out the crowds weren't exactly battering the doors down so I easily managed to secure a spot near the front by the stage for what turned out to be a pleasantly engaging set from the Danish quartet. 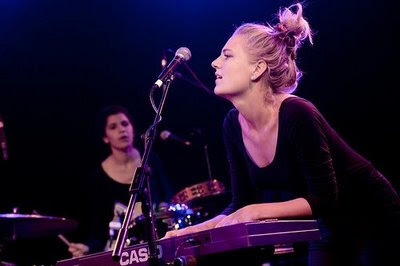 Newly signed to Bella Union, Chimes and Bells have been generating some positive feedback following their first two UK shows. I don't know much about them, their band name sounds like the sort of CD I'd find playing in the background at the therapy rooms where I practise but I assure you, their music is quite the opposite. At first I found them a bit cheerless and sombre, the sort of music if I played them to my mum she'd say "bit boring this isn't it" but amidst all the gloom I found the combination of plodding guitar sounds and the echoey and harmonious vocals full of energy and strangely pleasing. Their sound had a fullness and their performance was tight and even though they might not be my normal cup of tea, I am intrigued enough to want to hear more. 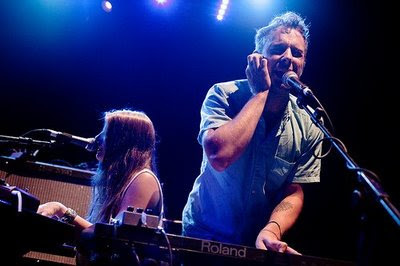 Brooklyn based Here We Go Magic were on stage next playing their first ever UK show. As we waited for the band to begin a slightly worried looking lead singer (Luke Temple) announced "has anyone seen our drummer?" Thankfully the drummer (Peter Hale) came racing onto the stage declaring as he ran that he "had to go pee! ", he then removed his shoes and socks, placed his socks inside his shoes and his shoes inside one of his drums and we were away-I'll assume he always plays barefoot and there hadn't been an accident. Here We Go Magic play a much softer melodic type of music with tracks such as 'Fangela' (chords sound a bit like Simon and Garfunkel's 'Mrs Robinson') and 'Tunnelvision' sitting comfortably in the indie pop genre. Without doubt, 'Only Pieces' was my favourite song of the evening, the live performance seemed to bring more depth to the harmonies making it sound even better than the already gorgeous recorded version. I thought the sound balance (too little vocal, too much bass) almost destroyed 'Fangela' and if I hadn't already known the track and been playing it in my head, I probably wouldn't have been that impressed. Overall, lots of fun but I think they still have a bit of tweaking to do to some parts of their live show. Hi Chalky, Good review, wish I had gone to this but the fact it was at the ICA put me off. You say it was Here We Go Magic's debut UK performance but didnt they play at the Bella Union stage at Wireless last weekend? I think Here We Go Magic were scheduled to play the Wireless fest last weekend but they didn't actually end up playing because of some confusion over times or something. OH MY GOD, THE POSTMAN!